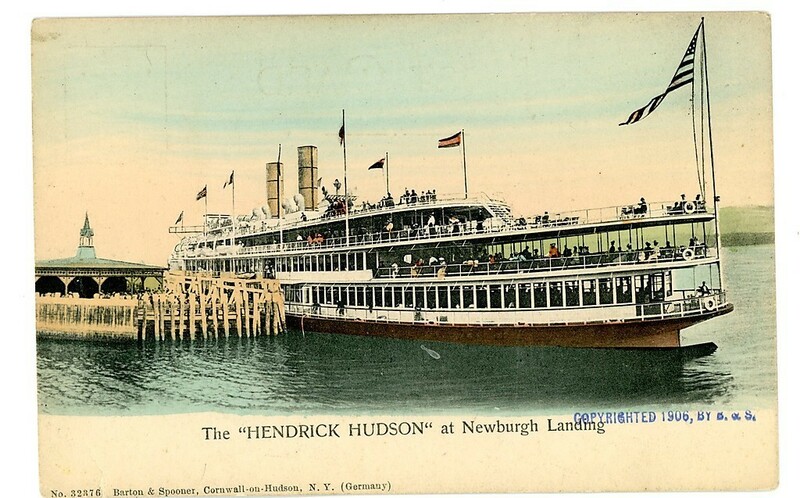 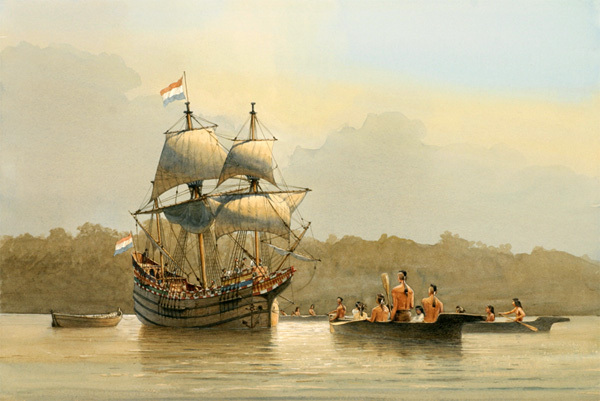 This page is dedicated to our beautiful Hudson and the floating vacations we enjoyed throughout our youth. The Half Moon - The very first "Dayliner"
This is called "Ice Boating on the Hudson". Ice-Harvest on the Hudson River, New York State, c.1870, from 'American Pictures', published by The Religious Tract Society, 1876. 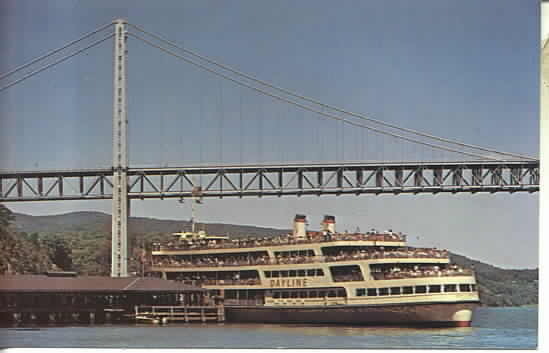 This scene is the Dayliner docked in Poughkeepsie. 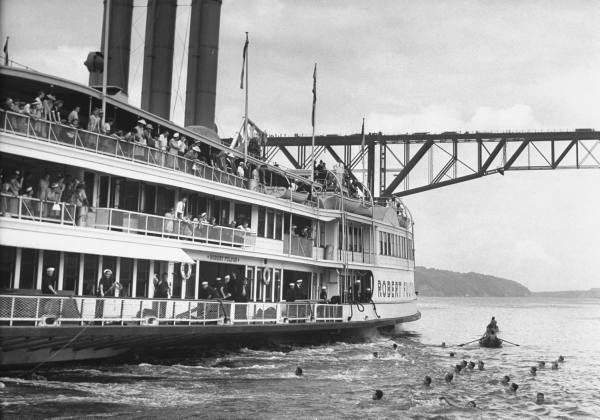 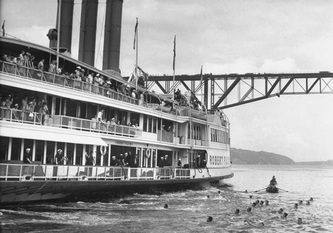 The kids in the water are diving for pennies that the passengers are tossing. 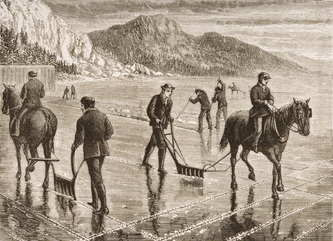 Do you think that this would be allowed in today's world? 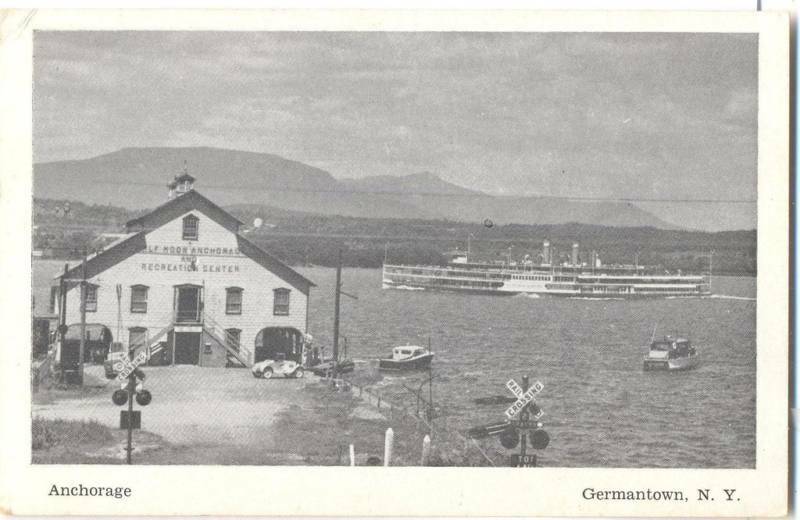 Jim Donnery sent us this one. 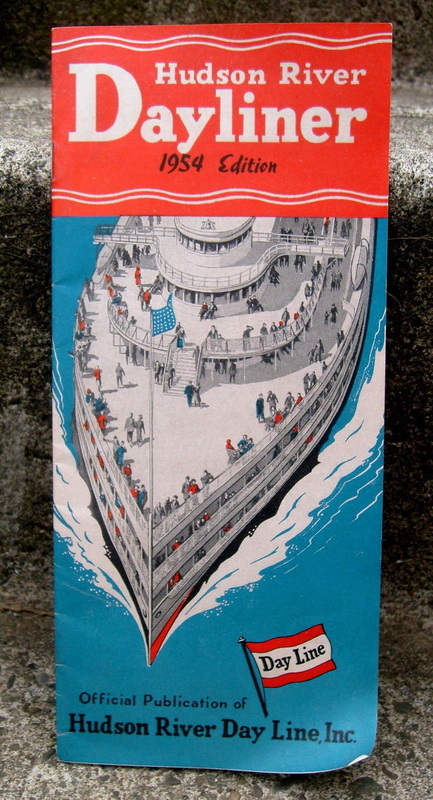 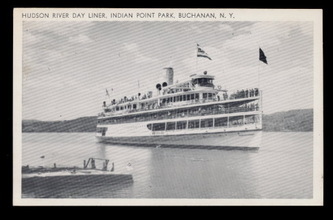 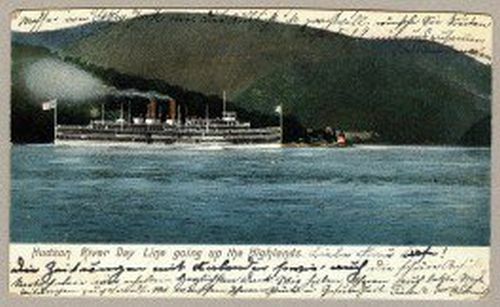 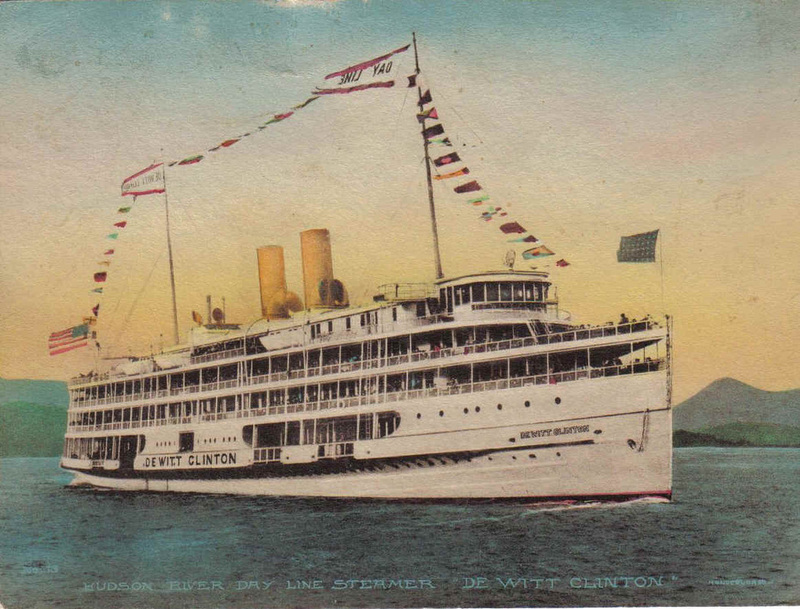 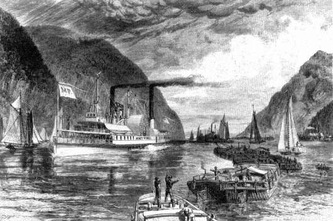 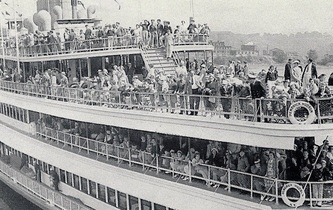 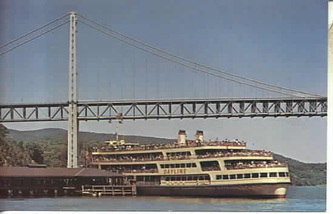 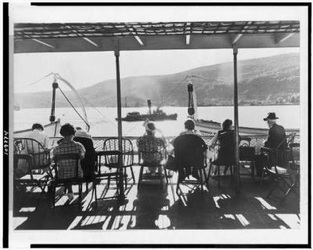 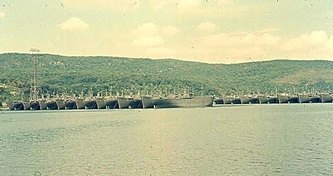 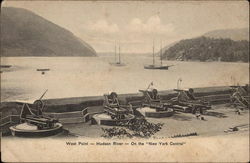 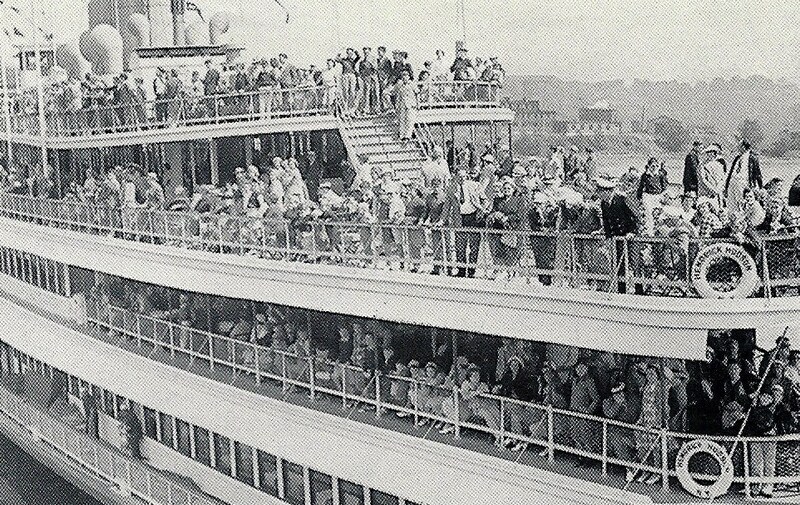 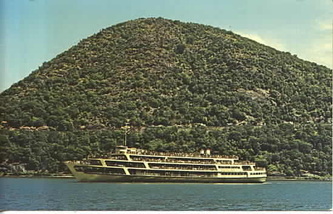 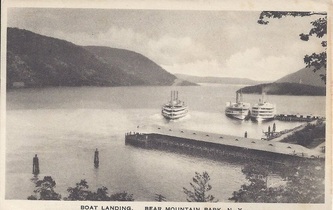 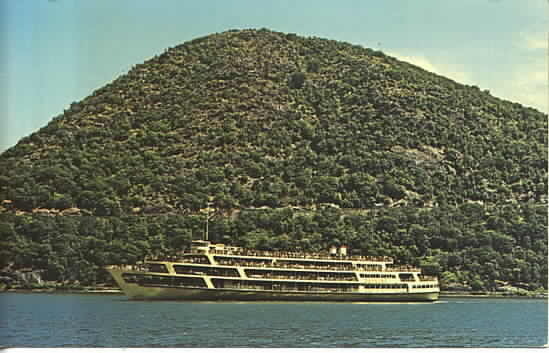 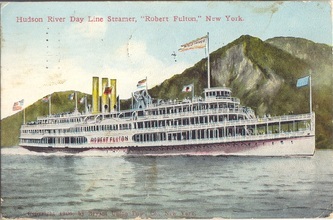 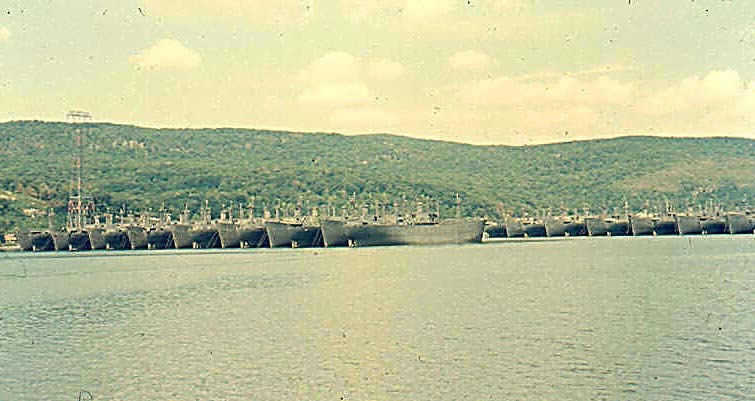 The postcard has three Dayliners, all vying for space at the Bear Mountain Dock. 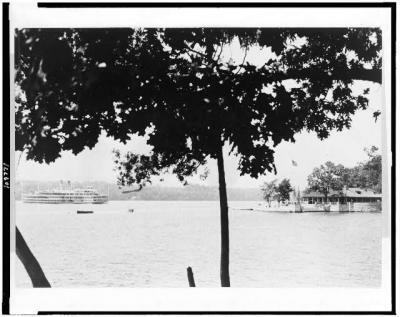 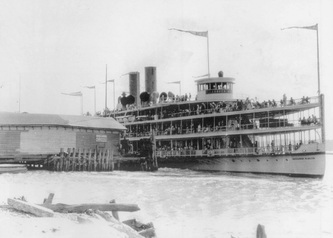 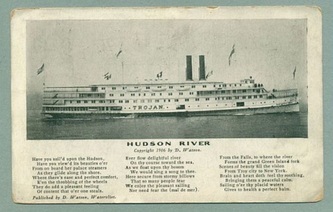 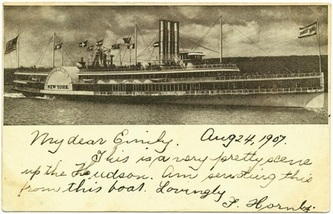 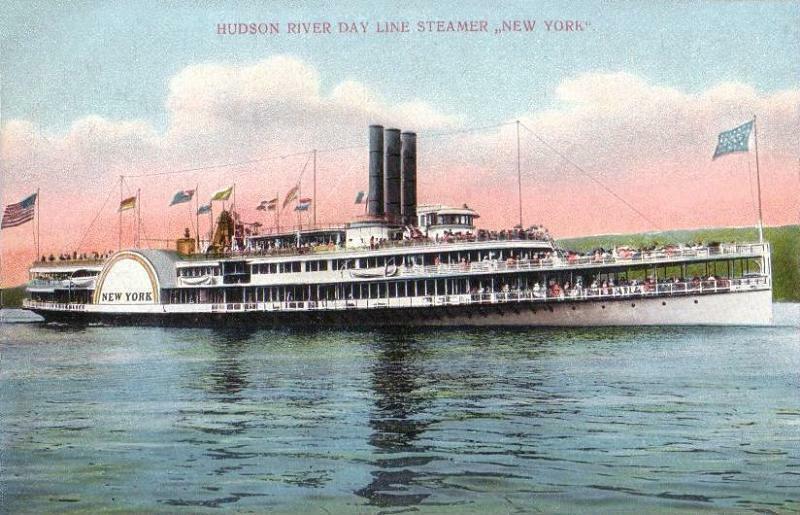 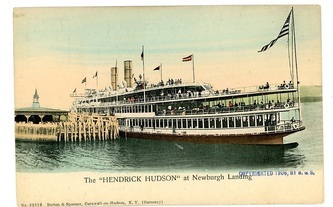 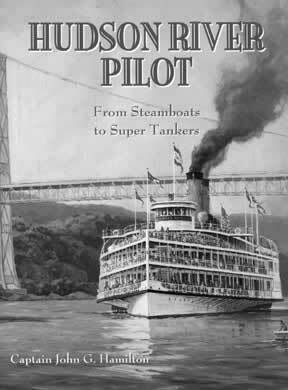 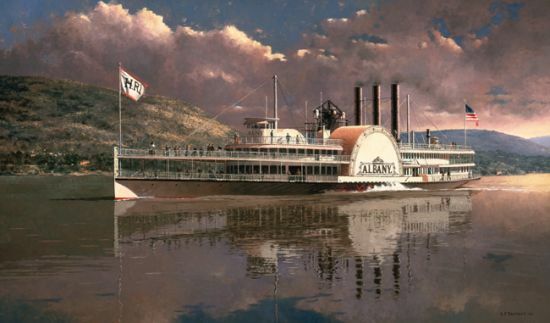 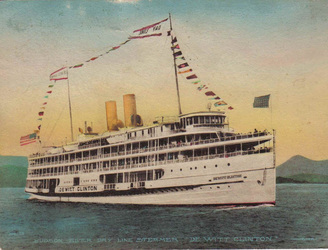 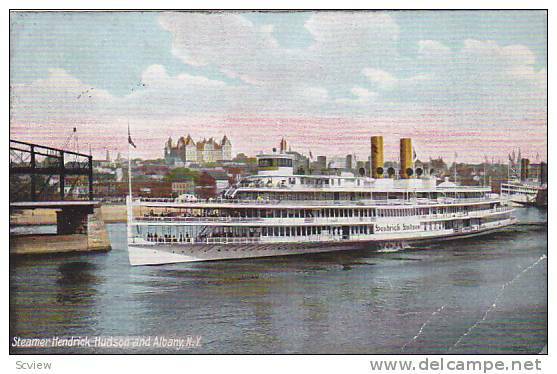 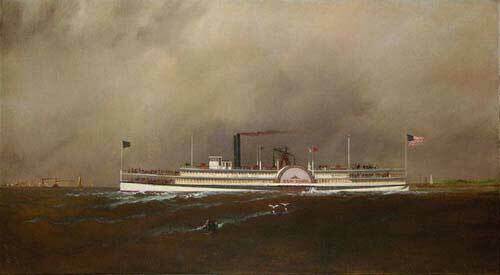 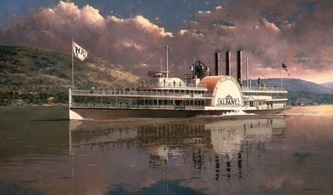 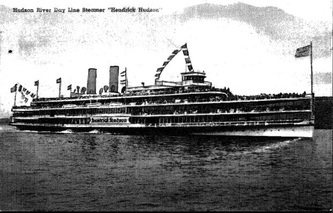 Courtesy of Kitty M. Helm - The Steamer "Trojan" 1909 ..........HUDSON RIVER Copyright 1906 by D. Watson Have you sail'd upon the Hudson,`--- Have you viewed it's beauties o'er`--- From on board her palace steamers --- As they glide along the shore. 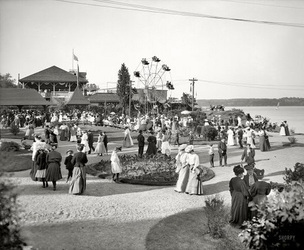 --- Where there's ease and perfect comfort, --- E'en the throbbing of the wheels --- They do add a pleasant feeling --- Of content that o'er one steals. 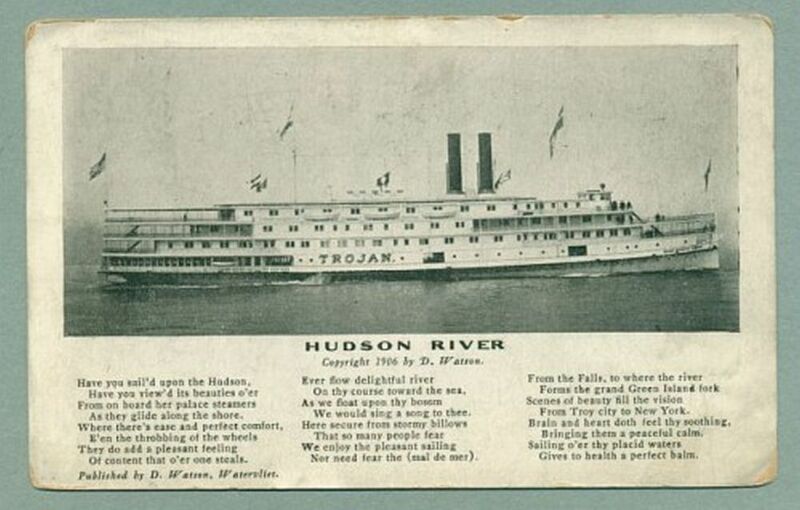 --- Ever flow delightful river --- On thy course toward the sea, --- As we float upon thy bosom --- We would sing a song to thee. 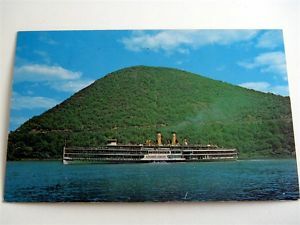 --- Here secure from stormy billows --- That so many people fear --- We enjoy the pleasant sailing --- Nor need fear the (mal de mer) --- From the Falls, to where the river --- Forms the grand Green Island fork --- Scenes of beauty fill the vision --- From Troy city to New York. 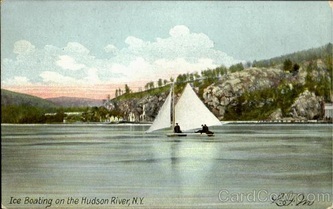 --- Brain and heart doth feel thy soothing, --- Bringing them a peaceful calm, --- Sailing o'er thy placid waters --- Gives to health a perfect balm. 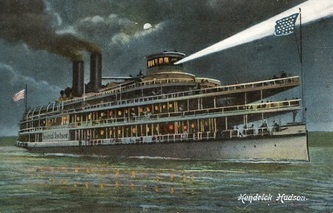 Another from Kitty. 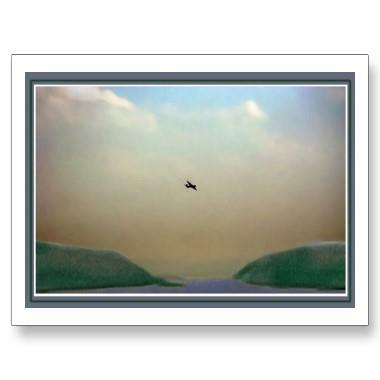 This one is called "Over the Hudson"